Hi everyone! 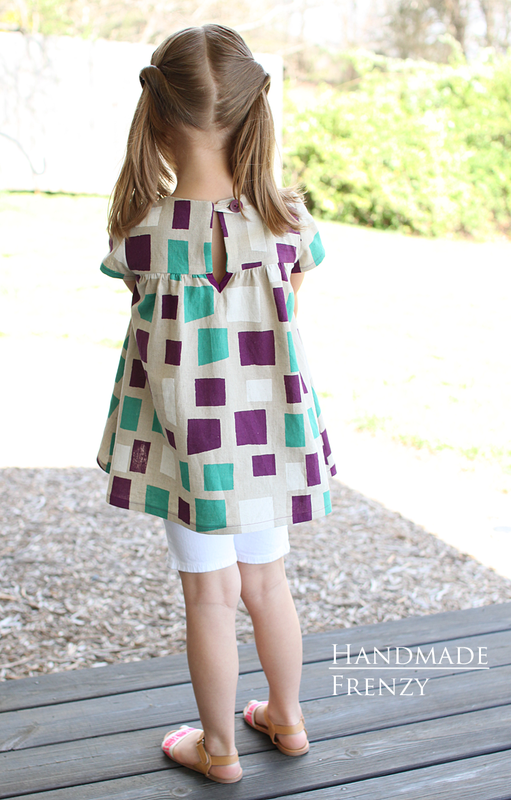 I'm so thrilled to be a part of this pattern tour today!! 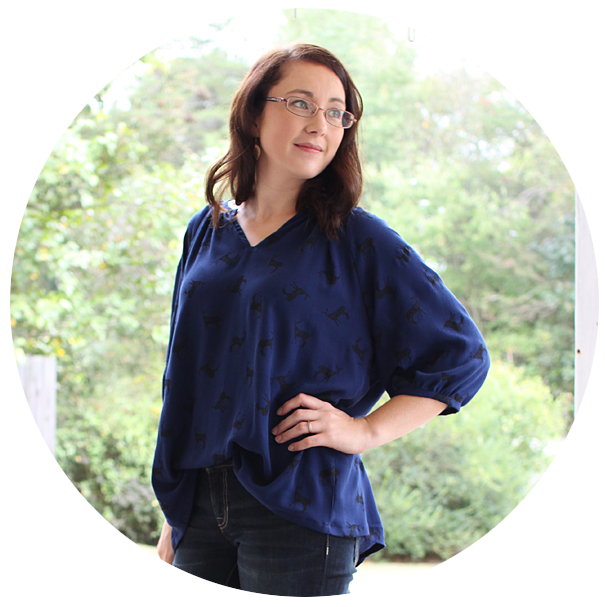 Olga (Coffee & Thread) is one of the very first blogging friends I made in this amazing online community. 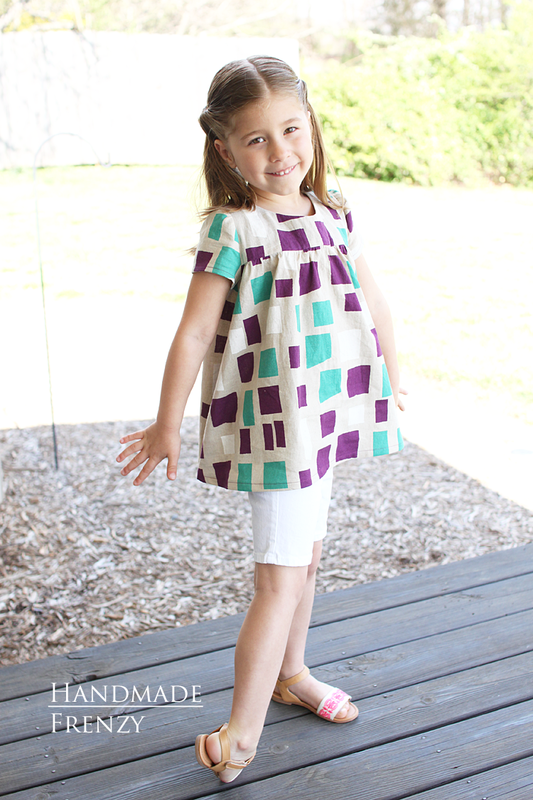 She is super sweet, knowledgeable and creates amazing patterns!! I have sewn a few of them over the years. 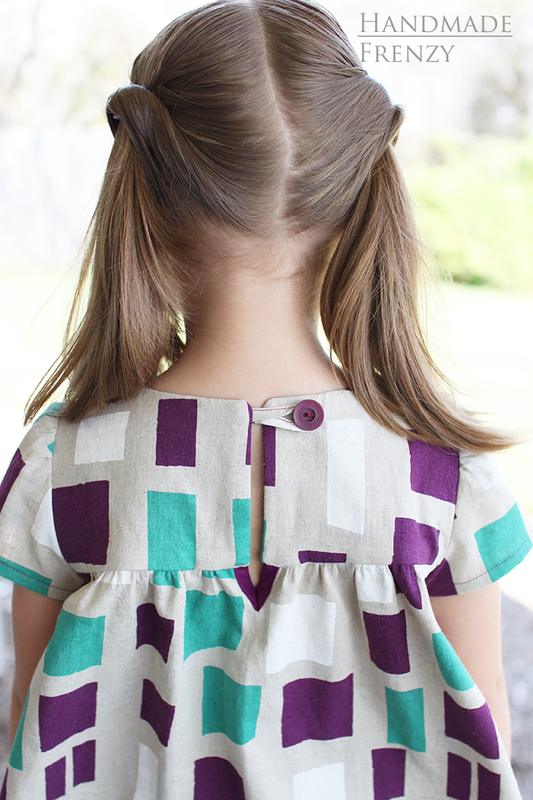 A couple of Mulberry Tunics here and here (which are now tucked away, impatiently waiting for boy #2 to wear them!) 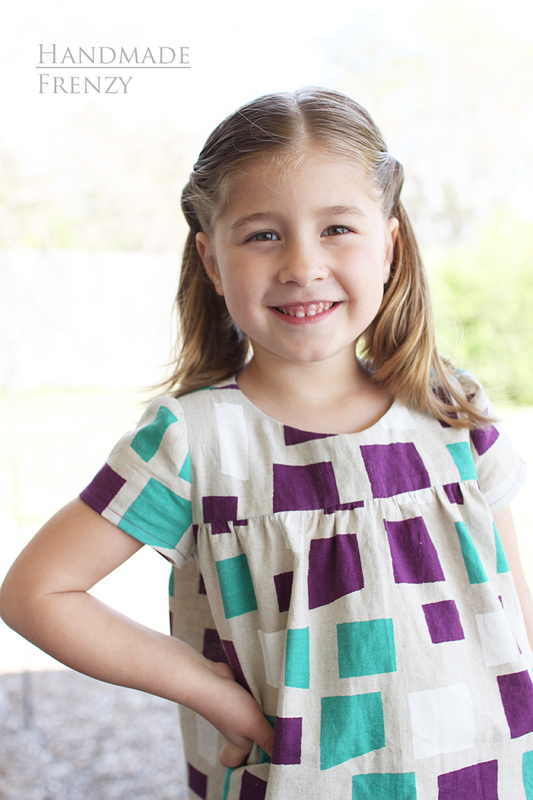 and last year's Eleena Dress, which she wore to church yesterday, and it still fits fine (yay!) except that it's turning into more of a tunic than dress length, yikes! 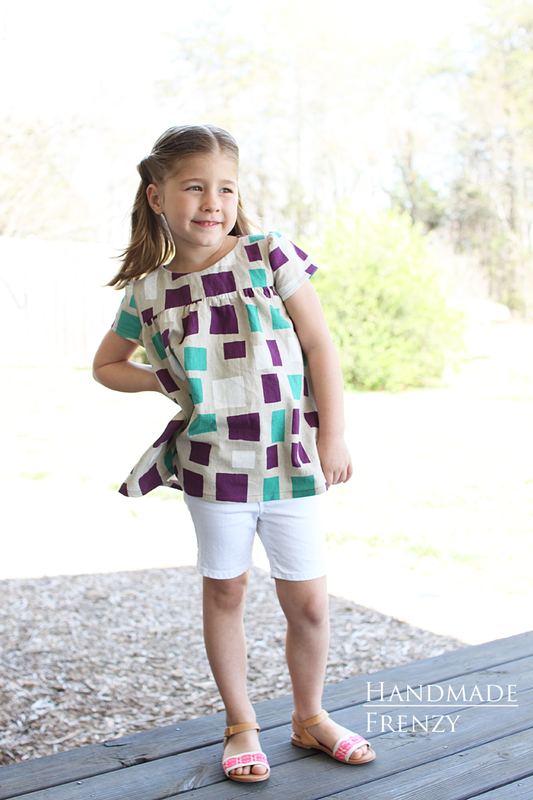 For the tour, I chose to make the Ania Tunic. I was smitten with this pattern from the moment I saw the first sample. There are many variations with this pattern (there is even a dress length version on the tour!! 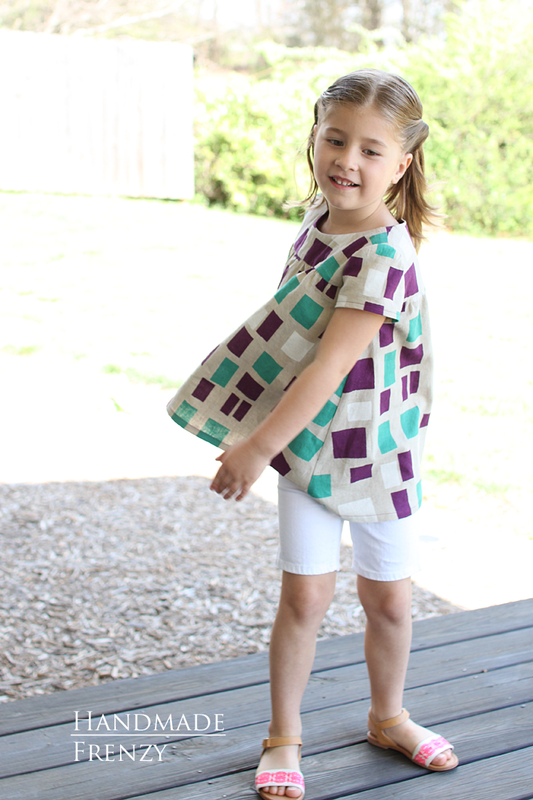 ), with sleeve and pocket options, or you can choose to make it in a woven or knit! I love versatile patterns so much. However for this version I decided to keep things simple. I used this amazing cut of linen/cotton blend from Miss Matatabi that I have been hoarding for a while and wanted to let the fabric shine. I sewed short sleeves since those get the most mileage around here and went plain with no pockets. I made a size 4 with 5 length. 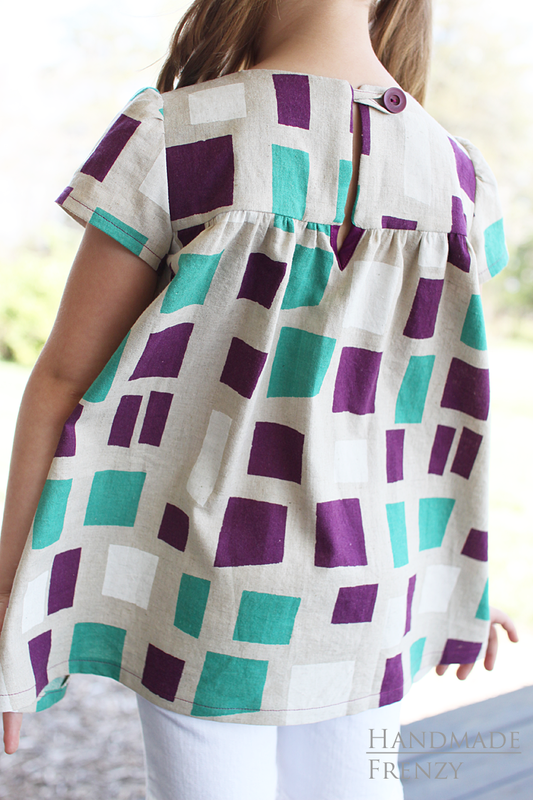 As always, sizing is spot on with Olga's patterns. I love the details in the back as well. I just so happened to have the perfectly matching button and Kona Cotton Solids laying around. The inside bodice is lined in the same fabric that you see a teeny bit of here at the bottom of the neck line split. I don't think I sewed the bias onto that little v part the way it was written in the pattern. Oops. But it turned out very well and I love the little additional pop of purple there. 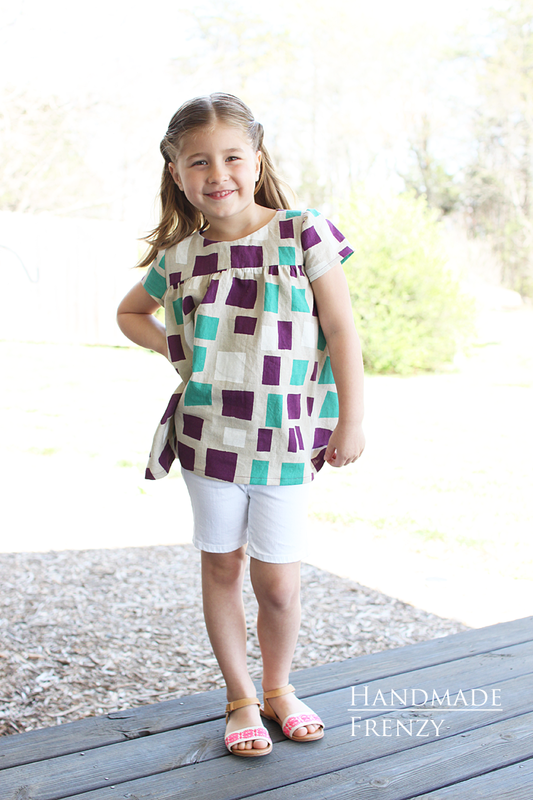 I love how this top looks with shorts and I know it will be just as great in the fall with a pair of jeans and cardi! Make sure to scroll all the way to the bottom for an amazing giveaway! Be sure to follow the tour, using the links availabe here! 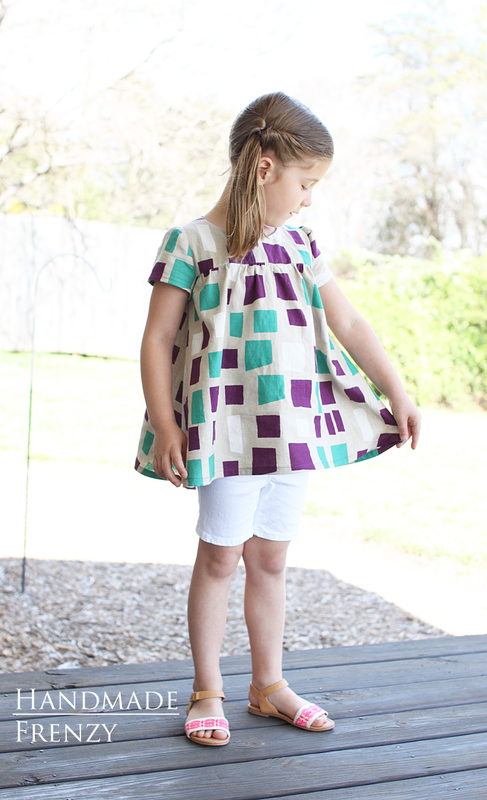 There is so much amazing inspiration and sewing going on, wow! Heidi this is so darling! Love the little purple binding and the sweet poses. Love her posing, so precious! The fabric is amazing! And I also happen to love golden hues. :) Love love how the top turned out! So so beautiful! 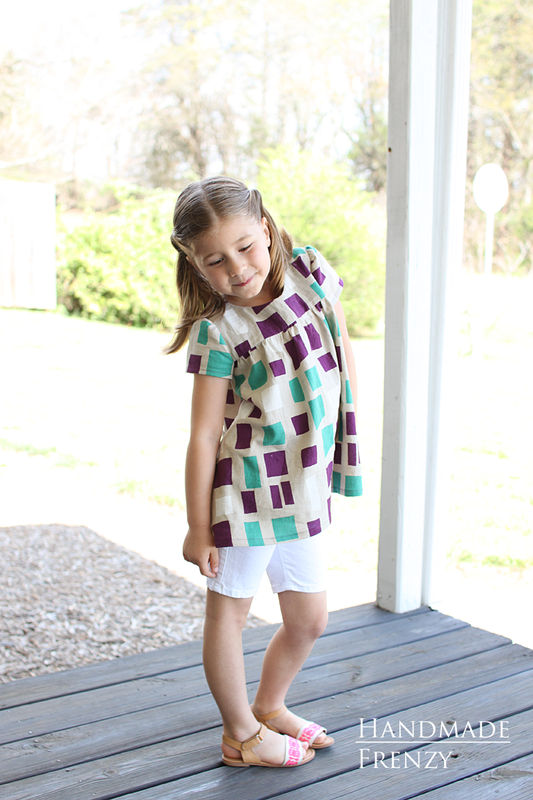 I love this Ania tunic! I really like the way you styled it as well. I totally get your girl: purple is awesome! As is gold... She looks very pretty! This Ania is so good! Love how modern and useful it is. And I love the pop of purple too. What a cutie pie and that top in that fabric is gorgeous. 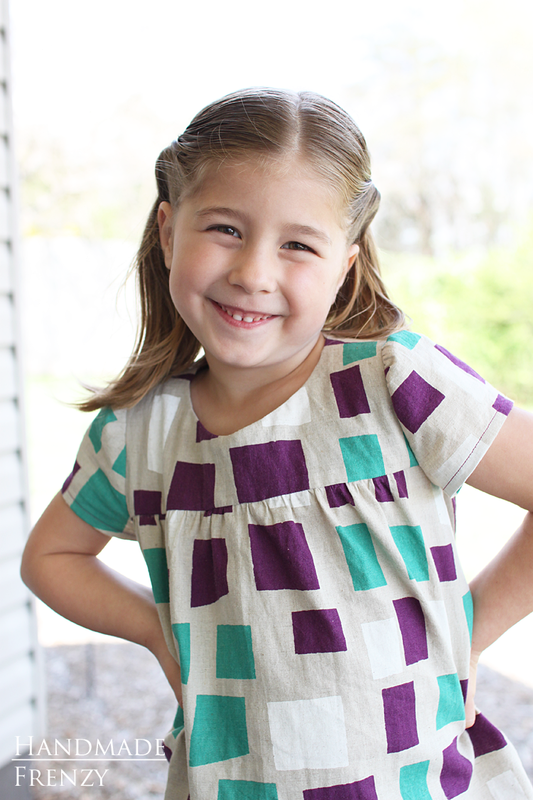 She is just the cutest, and I love your fabric! So beautiful! I love your fabric choice here! It definitely sells the pattern! Well done! Beautiful choice of fabric!! 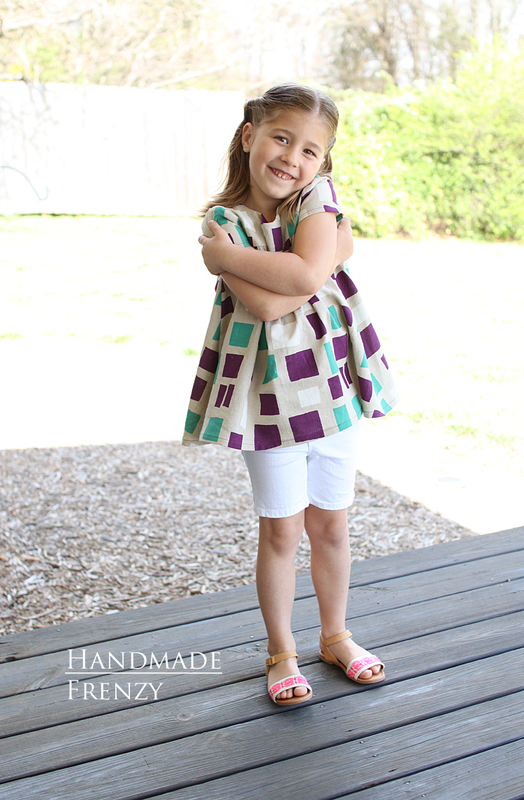 Makes me fall in love with the Ania top all over again! Such a little model with great sense of style! The top looks great on her. I can't believe she's smaller than my daughter, looking so smart. 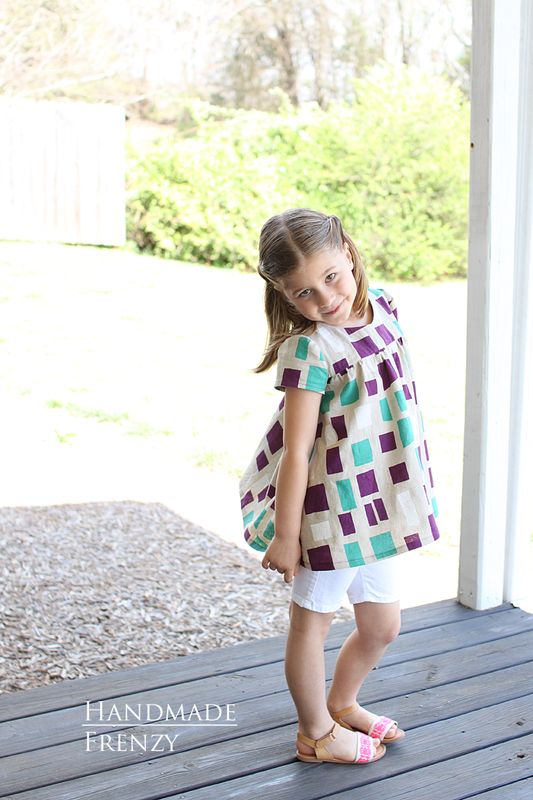 Love this pattern and love your version ! This fabric is so beautiful !